My favorite chocolate childhood dessert, easy pan brownies, just got a makeover. These gluten free fudge brownies are every bit as chewy and gooey as I remember. They’re so full of chocolate fudgy goodness, everyone swears they just can’t be GF. Ok, so I have become my mother. I keep EVERYTHING! But it totally pays off. (I’m trying to convince my husband of this 😛 ) Because of my mother’s and mine packrat tendencies, I’ve been able to keep gems like this. This is my mother’s old recipe box. From my earliest memory it always sat on our kitchen counter. By some miracle, it’s survived over four decades, a house fire, and a flood. 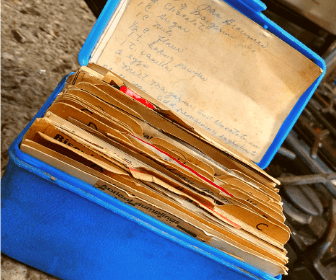 Tucked inside are my mother’s favorite handwritten recipes, recipes she cut out of magazines and glued on index cards, and even a few my Aunt Shirley shared. They’re like foodie snapshots from my childhood. Going through the index cards is like taking a foodie time machine back to my childhood. As soon as I rediscovered the box, I went right to a certain spot. Momma had them in alphabetical of course, but I had a favorite recipe I kept tucked way in the back because it was my favorite. One Pan Brownies. It’s the first dish I remember making from an actual recipe I could read by myself. I held it lovingly in my hands and felt super nostalgic. I wanted to make these again, so I made them over to be gluten free. I wasn’t sure how it would taste. Gluten free cooking can be so finicky. 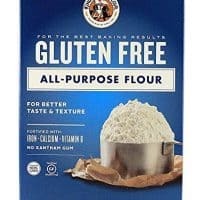 Could it be as easy as swapping the flour out for GF flour? Most recipes don’t work out so well when you swap gluten free flour for regular flour, but I tried it and, OMG, it tasted just like I remember. I think the reason why this recipe was so easy for an 8 year old to make is because everything gets mixed up in one pot. Just melt the chocolate and butter in a saucepan and then stir in the other ingredients. Pour into a square pan, bake, and bam, you’ve got the easiest gluten free chocolate brownies you’ve ever made. 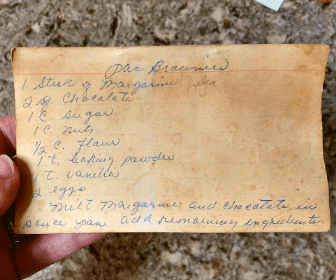 When I was a kid Momma kept Baker’s chocolate in the pantry, so that’s what I would use to make the brownies. I wanted a richer chocolate flavor, especially since GF baked goods can taste ho hum. So I switched out the Baker’s squares for Guittard semisweet baking bars. It definitely amped up the chocolate flavor and made these brownies gooey! 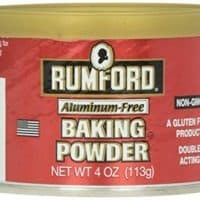 I swapped out regular flour for King Arthur’s all purpose gluten free flour and had great results. If you use a different brand (or use your own blend) please let me know how your brownies turned out in the comments below and I’ll add it to the post for other readers. If avoiding xanthan gum is your goal, you’ll be happy to know that I didn’t add any and, in my opinion, this recipe doesn’t need it. The texture is just like the fudge-like brownies you remember eating when wheat wasn’t a problem. My favorite chocolate childhood dessert, easy pan brownies, just got a makeover. 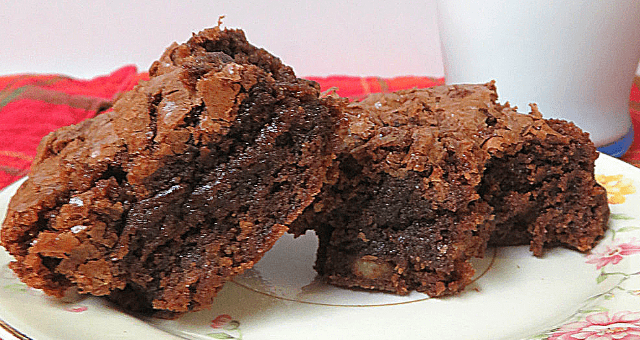 These gluten free fudge brownies are every bit as chewy and gooey as I remember. They're so full of chocolate fudgy goodness, everyone swears they just can't be GF. Over low heat, melt butter and chocolate in a saucepan. Remove from heat and let cool slightly. Stir in the remaining ingredients, adding the eggs last so they won't cook. Pour into a greased 8 x 8 pan and bake for 20-25 minutes, or until a toothpick comes out clean. Let cool then cut into squares. For extra gooey fudginess, sub chocolate chips for half the nuts. Stir in 1/2 cup chocolate chips and 1/2 cup chopped nuts.